Boy, that's a fancy gearing calculator. All sorts of dodads to look at and play with there. I posted a bit of my cam specs in my first post, but here's a pic of the cam card. No need to keep it under wraps particularly. I think duration is pretty close to the HO cam, only difference is more lift and a bit tighter LSA. I dare say its milder than the HO cam, especially being in a 347. Have gathered the remainder of the major items I need to complete the first two items on the to-do list I posted a few weeks ago. 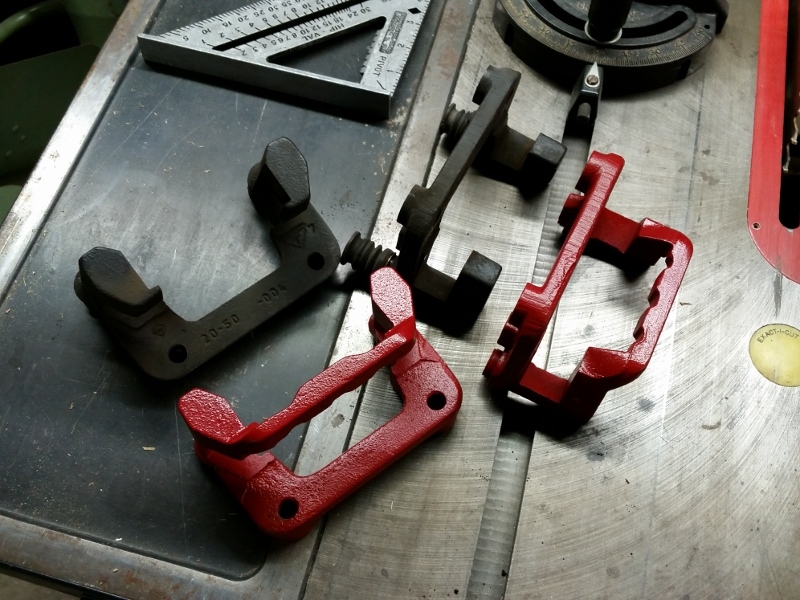 Early last week I ordered the Cobra caliper brackets to replace my existing modded V6/GT brackets, they came Thursday. They'll need the anti-corrosion goo cleaned off and painted. Then yesterday, made the weekly trip to Wal-mart, picked up a new pair of low-beam headlights while I was there. Don't know that I'll get around to doing anything with these this coming week due to work and other projects. The following week however, aside from holiday shenanigans, is wide open. 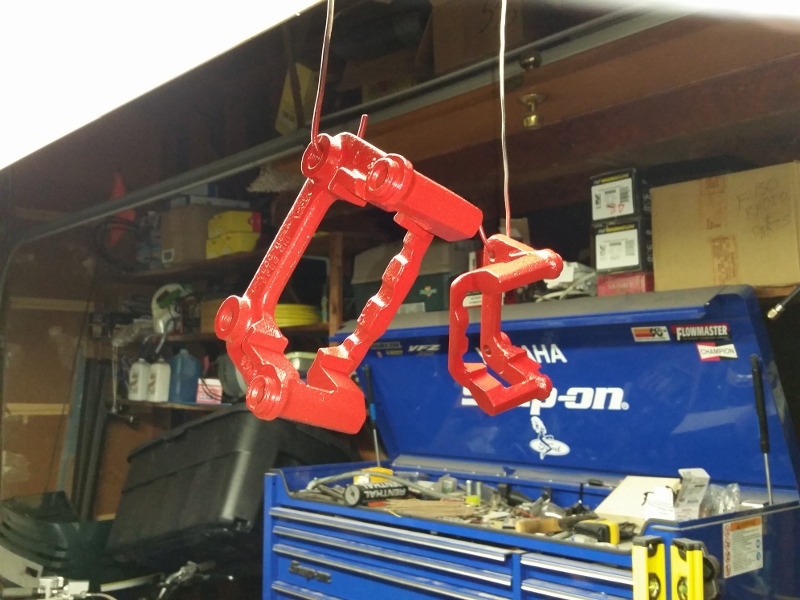 Managed to get out to the garage tonight to clean and paint my caliper brackets. Just realized I forgot to plug the slider pin holes, so will have to clean the paint out of those once the paint dries. What I get for trying to hurry I guess. Going to try to get them swapped out this weekend. Got my caliper brackets swapped out. Probably a good thing I decided to change these as I found I had a seized guide pin and a couple others were getting pretty rusty. New pins got a healthy dose of grease. 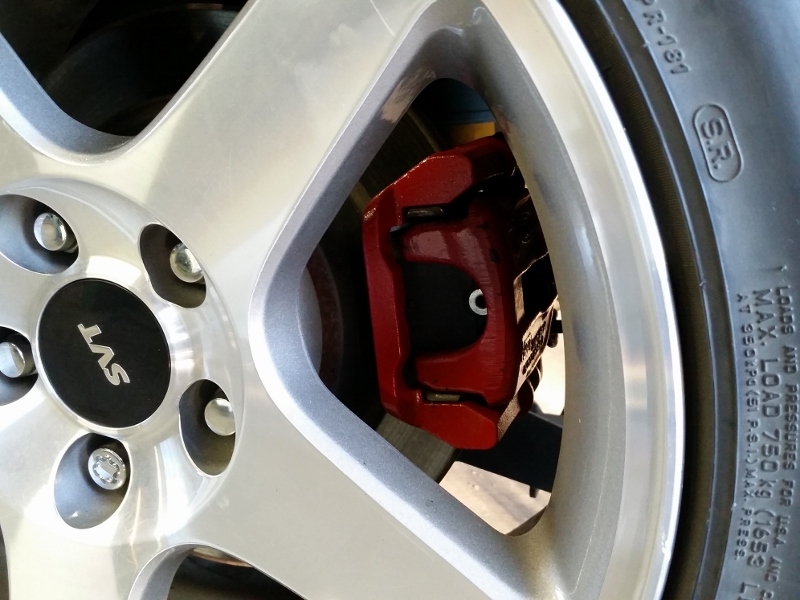 Here's a nice side-by-side if you've ever wondered the difference between the SN V6/GT and Cobra calipers, it's all in the caliper bracket, the calipers themselves are the same. Now to start working on that headlight harness. Great looking car and excellent progress! Thats interesting. How far is "a few miles"? Blownsob, sent you a PM. Awesome build! Really looks great! 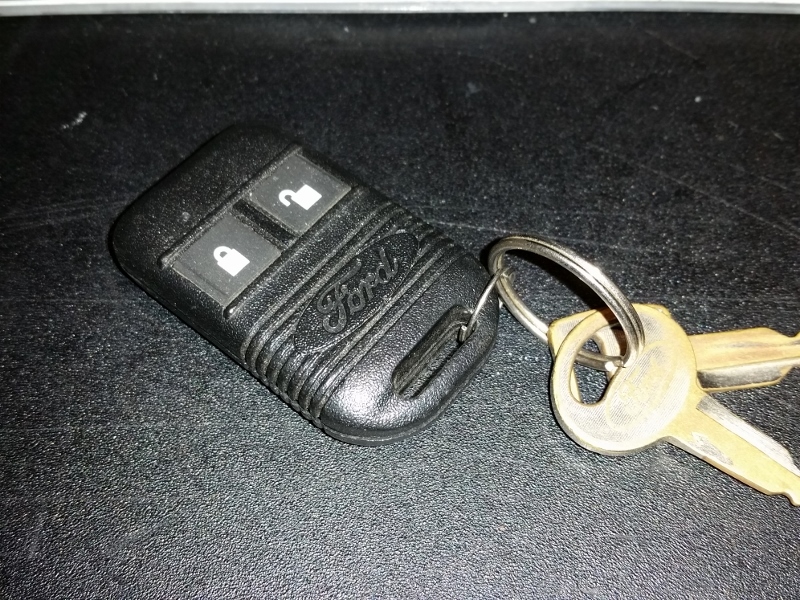 Hey, what are the details on your keyless entry mod? 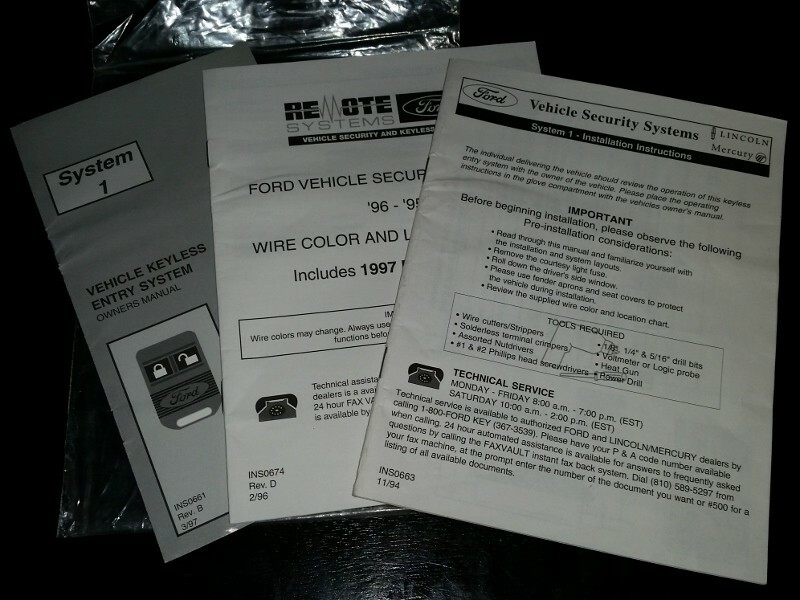 The keyless entry system is a Ford accessory kit, I assume a dealer-install item. 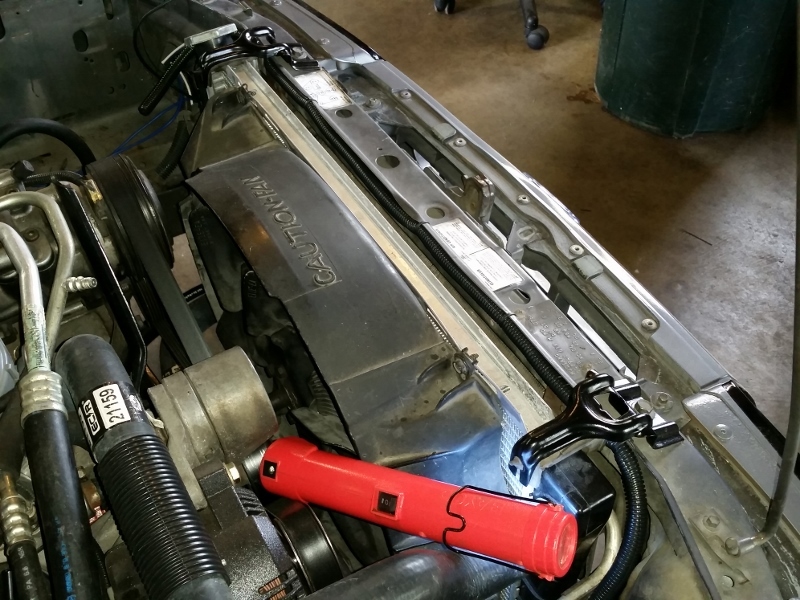 Had been trying to figure out how to retrofit an SN95 keyless entry then ran across the kit on ebay years ago and was able to get it for a decent price. Its from the mid-90's, but installed pretty easily. That is so cool! When I was thinking of a way to do that on mine, I didn't even think to look for one of those kits! I always like it when stuff like that looks like it could well have come from the factory. 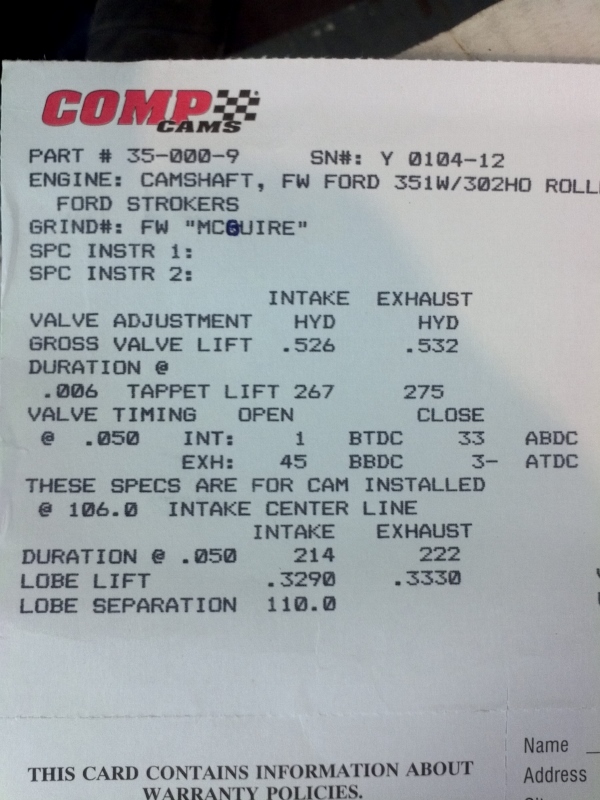 No better way to do that than use Ford stuff! I ended up with a cheap ebay kit. It does the job, but it's just not the same. Well done! Thanks. I try to make things look factory and use Ford parts when I can - don't know that I always pull off the execution, but I try. This was one of those things. Couldn't stand the thought of some goofy looking keyfob mingling with my keys. Below is a pic of the keyfob from the kit. 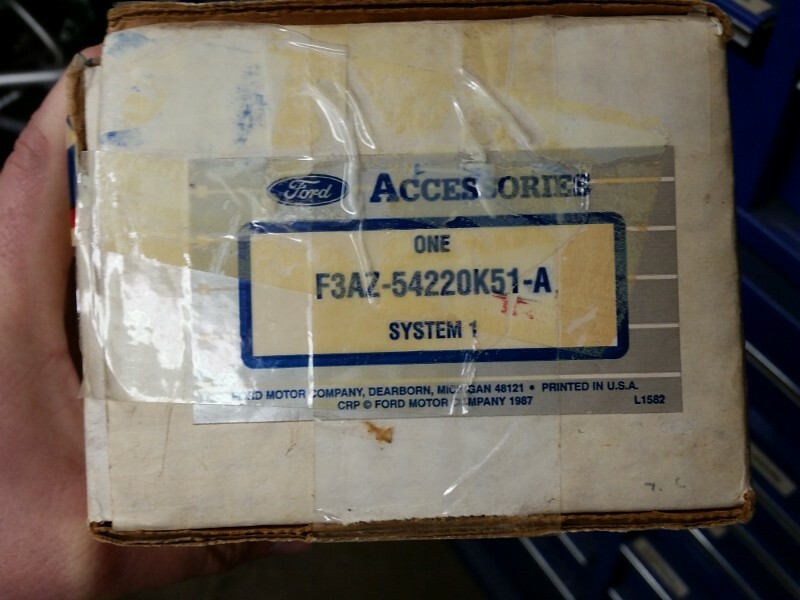 Not sure if it was a "factory-issued" keyfob or not, but at least is says Ford on it. Making some slow progress on my headlight rewire. 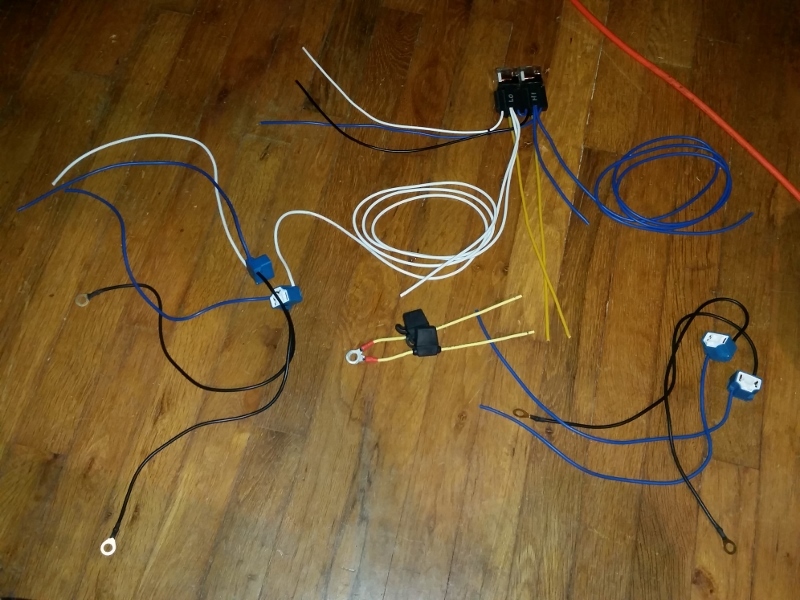 Doing some prep-work on the "universal" harness I bought. I thought it would save me some time, but I should've just bought the stuff and made my own. I didn't pay much for this harness, $30-35 if I remember, and you can tell. 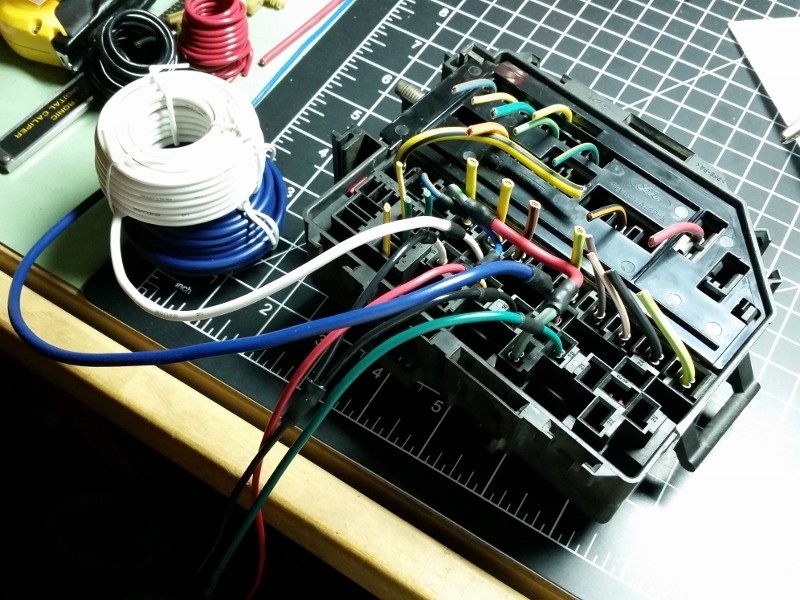 Wiring is lighter that I'd like, the connectors are cheesy, and I wouldn't bet much on the relay quality. I'm going to go ahead and run it for now, though. Between this and a couple other new circuits I've added I'm starting to get a bit of a rats-nest of wiring coming off my starter relay. 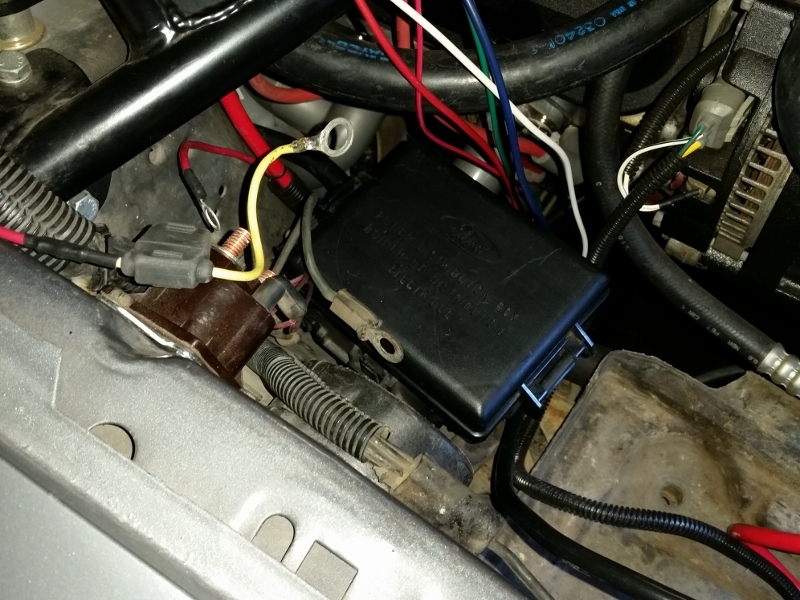 Seen a few other members here adding the later-model under-hood power distribution boxes that contain fuses and relays. I'm thinking that will make a good project for the near future. 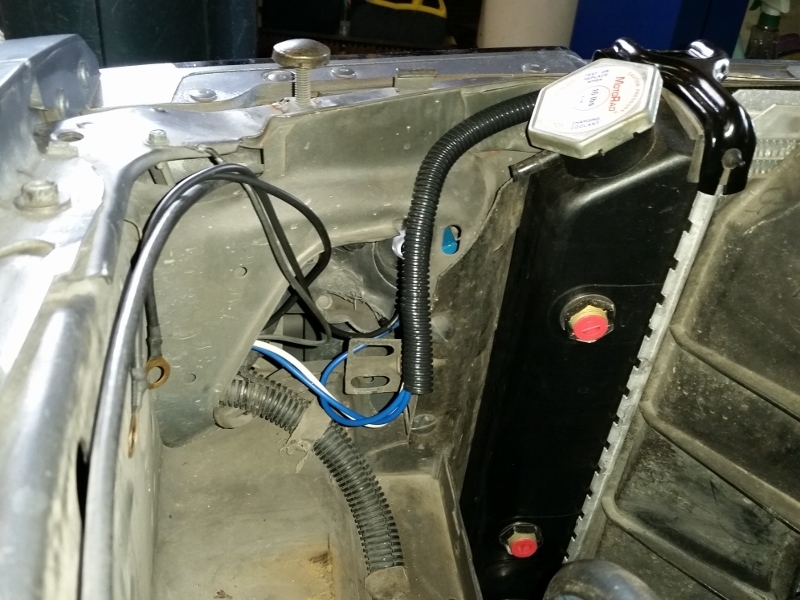 As for this harness, I've cut it apart to be able to fit it as neatly as possible in the car, re-pinned the headlight sockets (think they were wired for a different type of bulb), and added individual power wires w/ fuses. 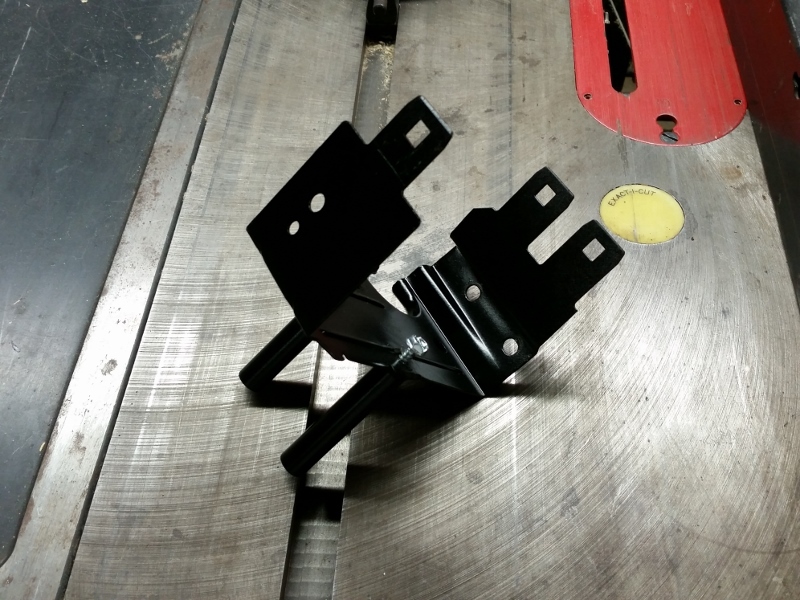 The harness originally came with one fused power wire which powered the hi-beam relay, the lo-beam relay was then powered through the NC terminal of the hi-beam relay. This is so that the lo-beam bulbs turn off when the hi-beams are turned on. The hi-beam switch in our mustangs already does this, or mine does at least. I also wasn't particularly keen on having the lo- and hi-beams powered through one fuse. My thought is that if something shorts and a fuse blows I should still have one functional set of lights to get home with. Well, after a couple months of little free time and no motivation to work in a cold garage, started warming up here a few weeks ago so finally getting some work done on my car. 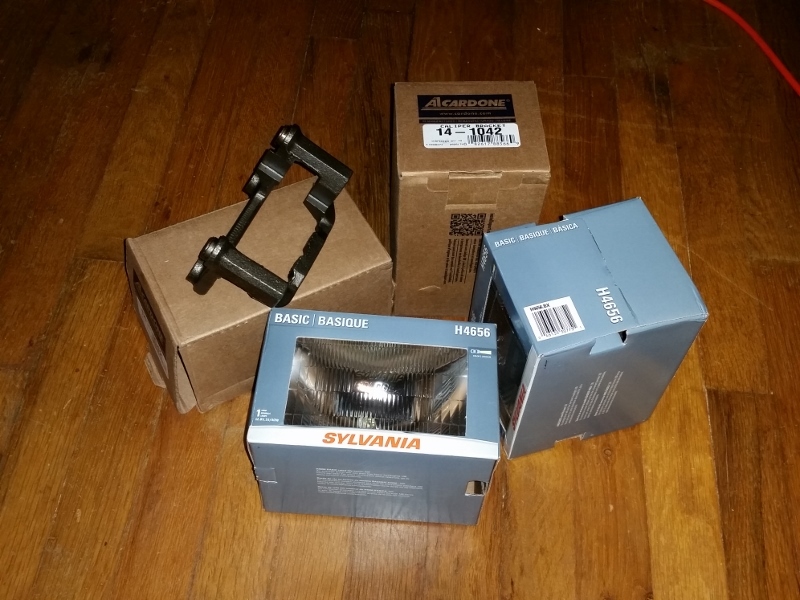 I did spend some time during my "indoor period" collecting and prepping for the headlight rewire project. 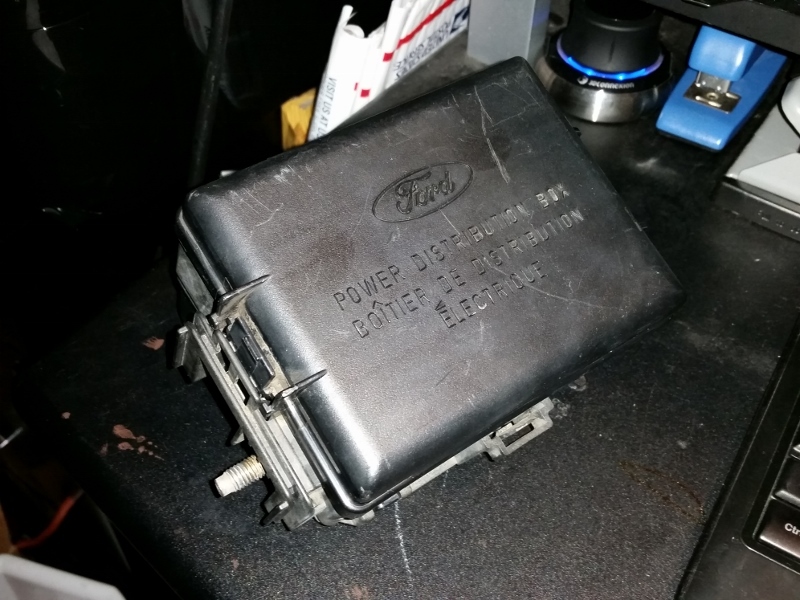 Since I was waiting, figured I'd snag a SN underhood fuse box to use instead of the ebay headlight harness. Felt this was a better way to go instead of having relays hanging out in the elements. 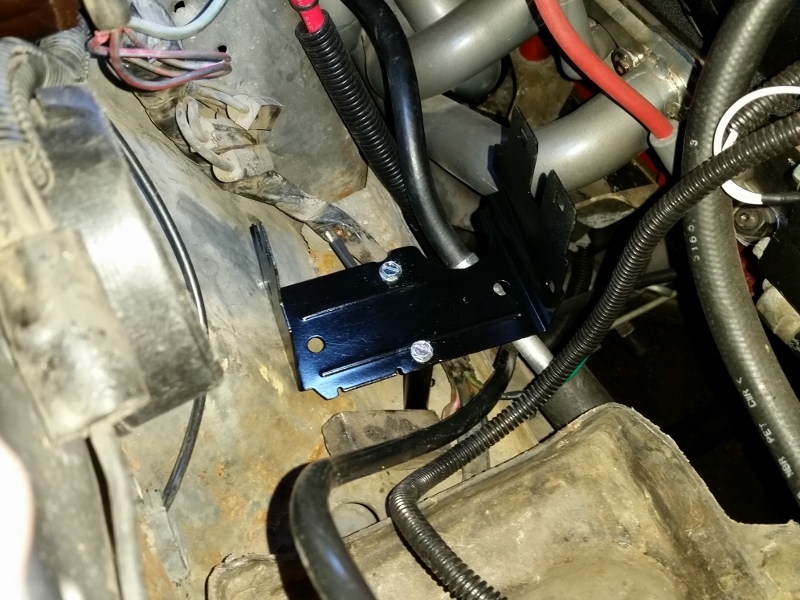 Modified the factory bracket to mount it in the car. 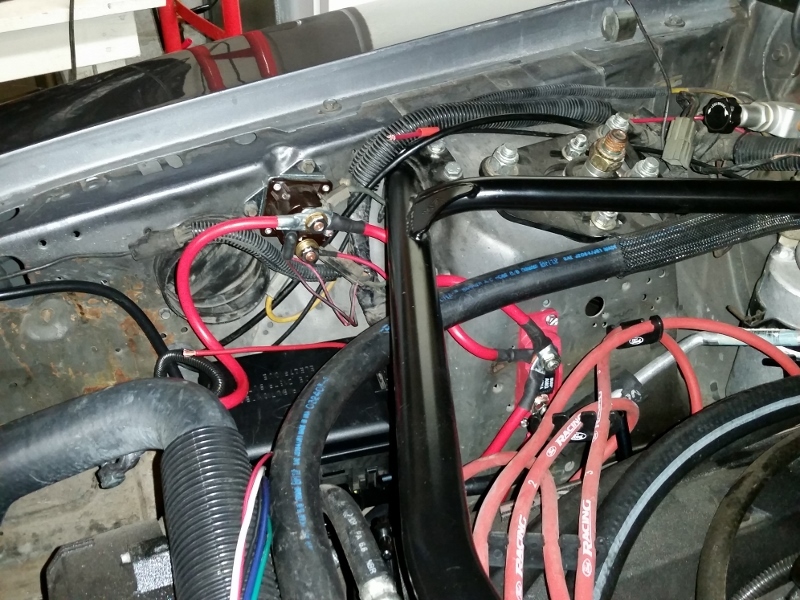 Decided the best place for it was on the frame rail between the battery and strut tower. 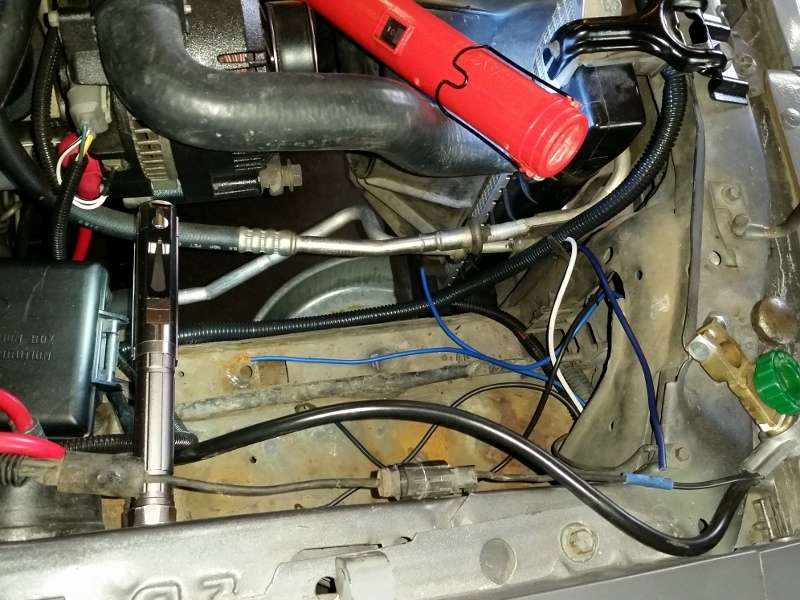 Doing so necessitated moving my alternator fuse and rerouting most all of the positive cables. Headlights were wired through two fuses and two relays in the fuse box which I prepped on workbench. 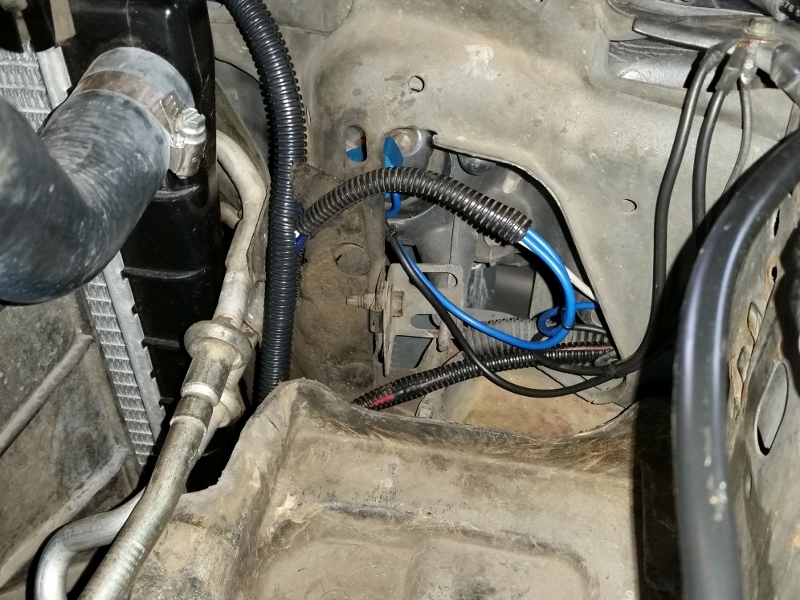 Relay actuator wires connected to the factory headlight power wires and new heavier gauge wires ran from relay outputs to the headlights. Now have plenty of fused circuits and a few relays for any future electrical needs. Think it turned out pretty well. Glad to get a project checked off the list. Now just need to decide what to work on next. You still haven't got that thing together? Fixed something that's needed done since doing my 3G alternator swap. The retaining clip on the single-pin stator wire connector that came on my salvage alternator was broken when I bought it. I had intended to replace it during the swap, but at the time I couldn't find one to purchase for some reason (probably wasn't searching for the correct name). It's stayed on and worked fine with the broken clip for the last two years. 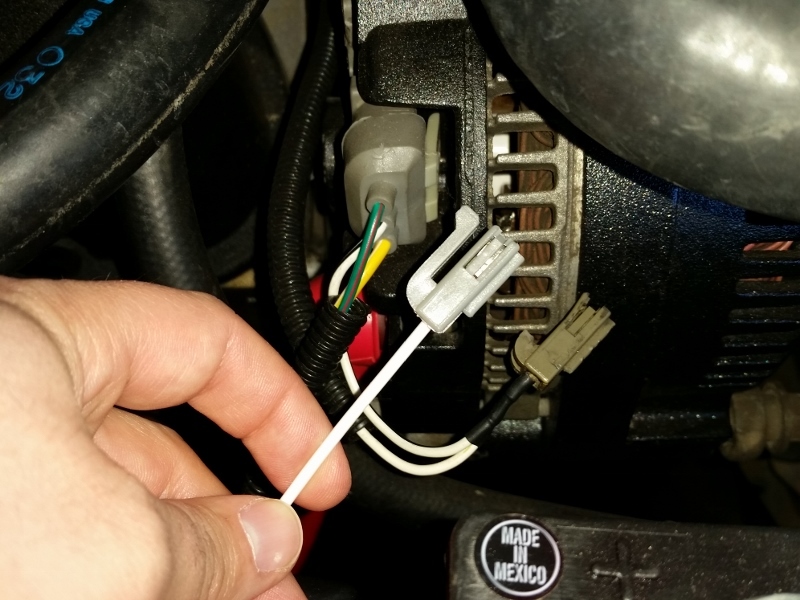 However, with all the wiggling of wires during my headlight rewire project it came off without noticing. 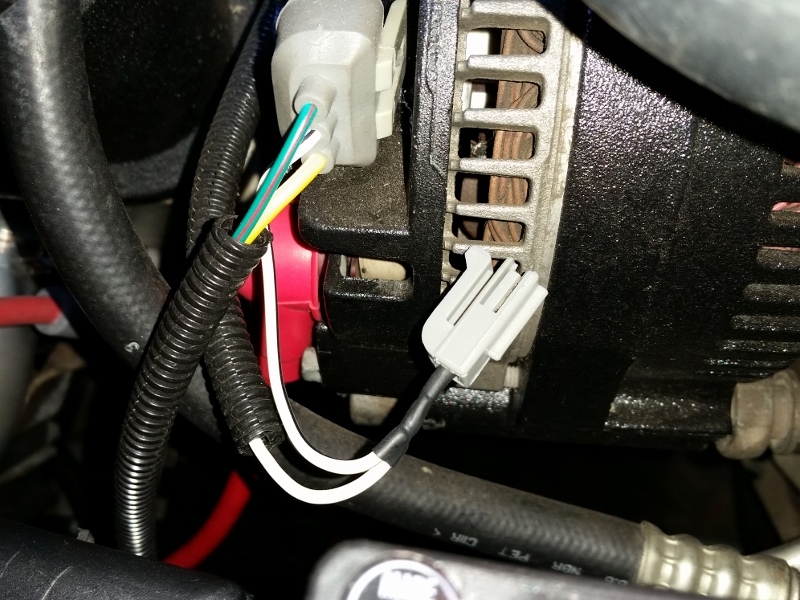 When I went to drive the car after getting everything together I found as the car was warming up the electric choke wasn't opening. First thought was "Damnit, my choke cap burnt out. 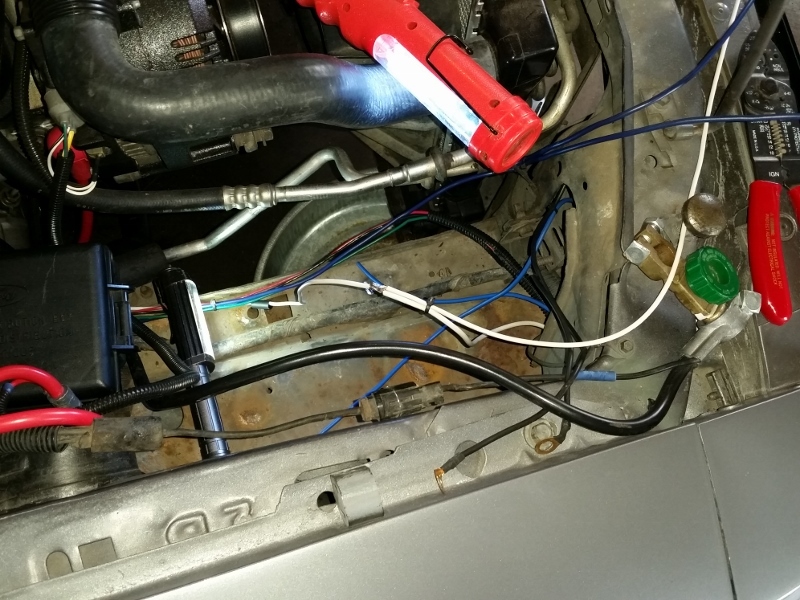 ", but after a few minutes I smartened up, went and got my multimeter and found no voltage at the choke cap. Then found the connector had come loose. Decided it would probably be best to fix it to not have to worry about it again, so got online and found the connectors on amazon for $6 and ordered one. It was in the mailbox when I came home from work today. I took the easy way out and unpinned the terminals from the connector body and swapped the new on onto my existing terminal. Not a huge accomplishment, but another thing that can be marked off the list.